I never thought I would see the words breakfast and salad together, unless we were talking about a fruit salad or it was opposite day and breakfast actually meant dinner. However, the day has come and I am not talking about a fruit salad, although there is fruit in this salad, and it is not opposite day, at least the last time I checked. No, today we are legitimately talking about a salad for breakfast. I often find myself stuck in a breakfast rut. Lately it’s been a banana and a Greek yogurt every. single. morning. Anyone else? Then I started seeing breakfast salads popping up all over Instagram. You would think with my salad aversion I would have kept scrolling, but the possibilities for combinations of toppings drew me in. 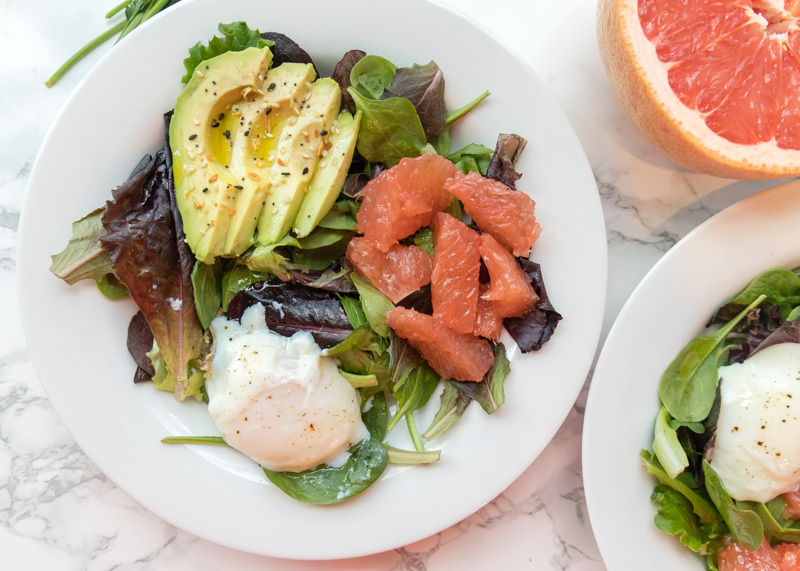 Salads for breakfast are actually awesome and don’t let anyone tell you otherwise! Here are three reasons I think salads for breakfast are pretty cool: 1. Salads are quick and easy to make, especially when almost everything is prepped ahead of time. This checks a serious box for weekday breakfast approved. 2. 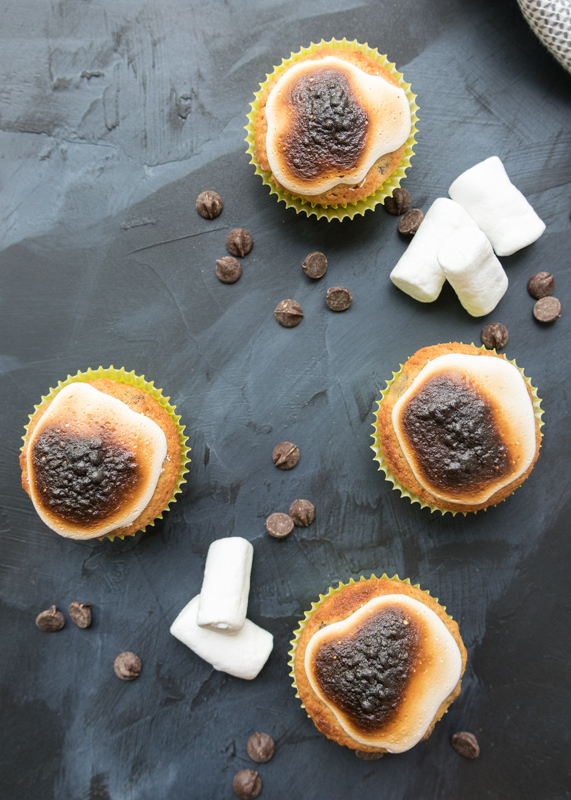 The topping ideas are endless! If you wake up craving something sweet then you could load it up with some fresh berries. Feeling savory? Throw in some chicken sausage. 3. This is the most boring reason, but a very important one. 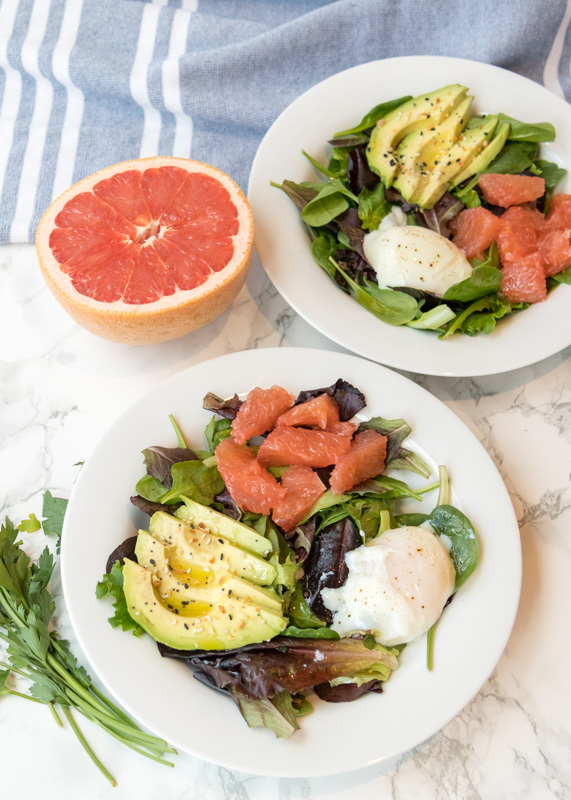 I find breakfast to be a hard meal to sneak veggies into and a breakfast salad is a perfect way to get more vegetables into the first meal of the day. 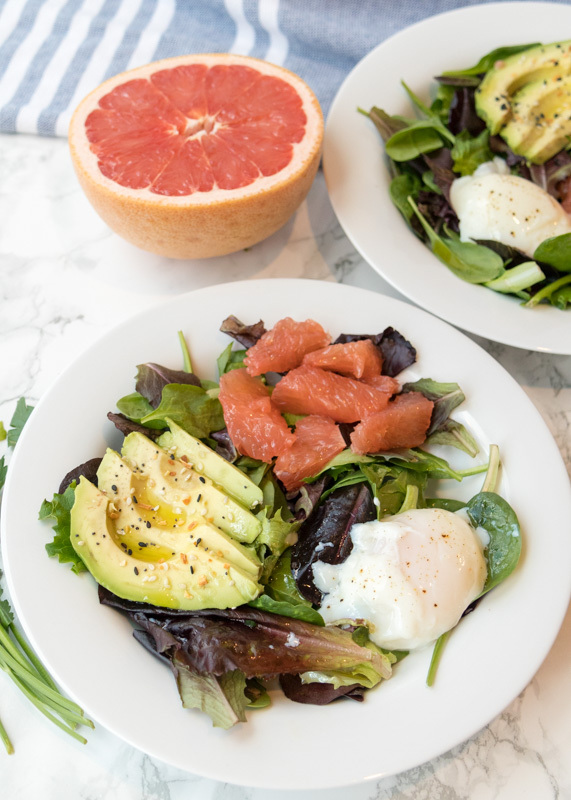 For the first Lemon & Mocha breakfast salad bowl I went with a grapefruit and avocado pairing along with a runny egg, of course, because the runny yolk mixed with the dressing takes it to a whole new flavor dimension. The dressing is my favorite quick shallot vinaigrette. 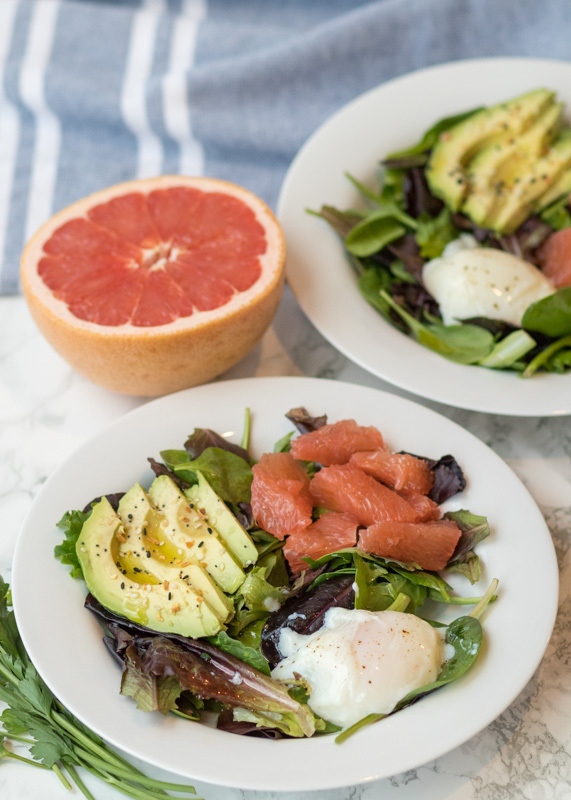 It’s flavorful, has the right amount of acid and beautifully complements these breakfast salad bowls. Although there are no grains in the photos, when I usually make this dish I add quinoa. I forgot it when I was rushing to take my photos, but it adds some heartiness to the dish and soaks up the yolk really well. Farro or barley would both be good substitutions as well. 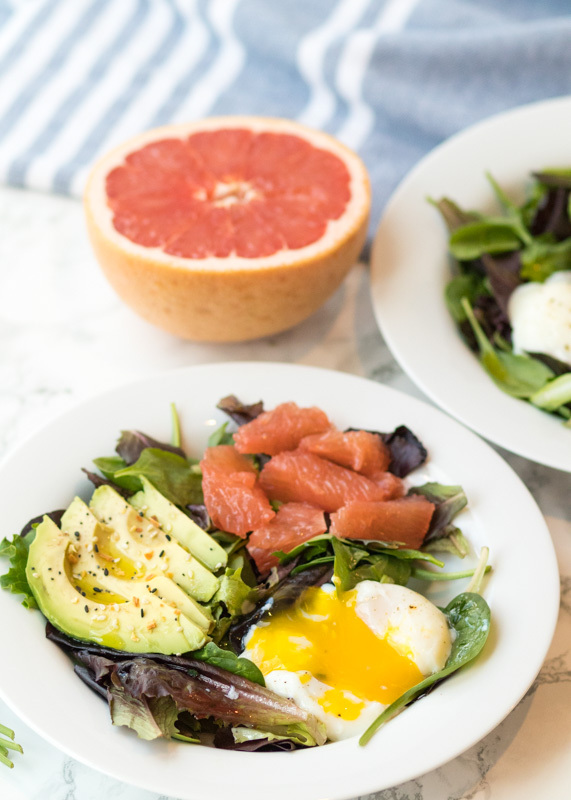 So, do you think you’re going to try a breakfast salad bowl soon? Place 3 cups of the washed salad greens in 4 shallow bowls. 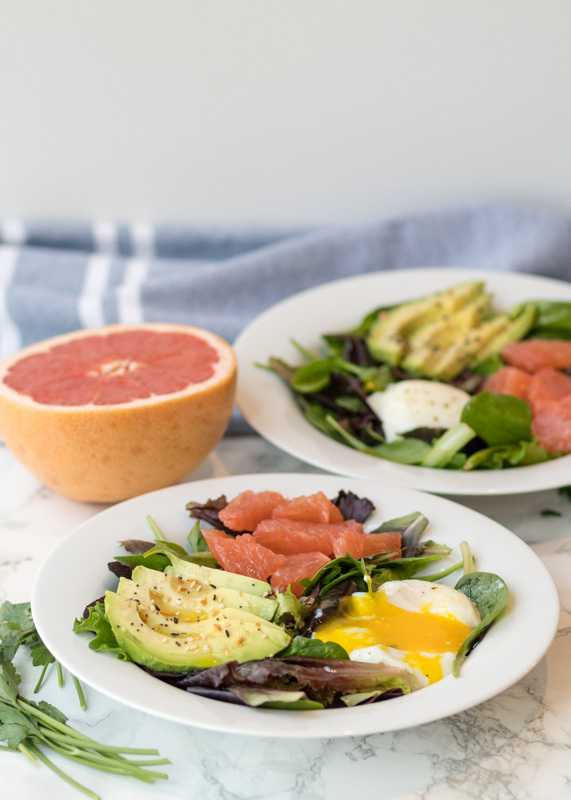 Divide the grapefruit segments, avocado slices and eggs between each bowl. If you are using quinoa add it now. Sprinkle the everything bagel seasoning over the avocado slices. Top with the dressing and enjoy. Whisk all ingredients together. Salt and pepper according to taste. I included the quinoa in the recipe because that was my original vision for this breakfast salad, but I forgot when I made it to take photos - oops! The grains go nicely with the salad, especially to soak up the egg, and make it more filling. If you don’t want to use quinoa, farro or barley would both be good substitutes. I’m so excited the muffin of the month is back on track with another delicious, seasonal and so-good-I’m-just-going-to-have-one-more muffin. 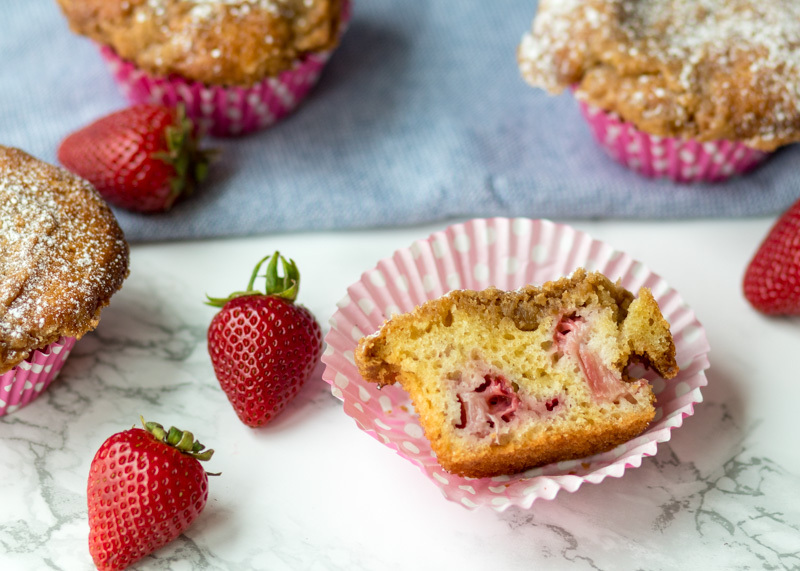 Strawberries and rhubarb are now in season so it makes perfect sense that the May muffins are Strawberry Rhubarb Crumble. 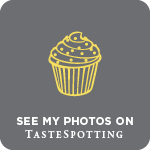 I have been diligently making (and eating) the Food Network Magazine’s Muffin of the Month for 2018 and reporting to you all with my feedback and the recipe. Although Matt and I are still having a hard time saying anything can beat the March Irish Cheddar, Bacon and Potato Muffins (yes, they were that incredible! 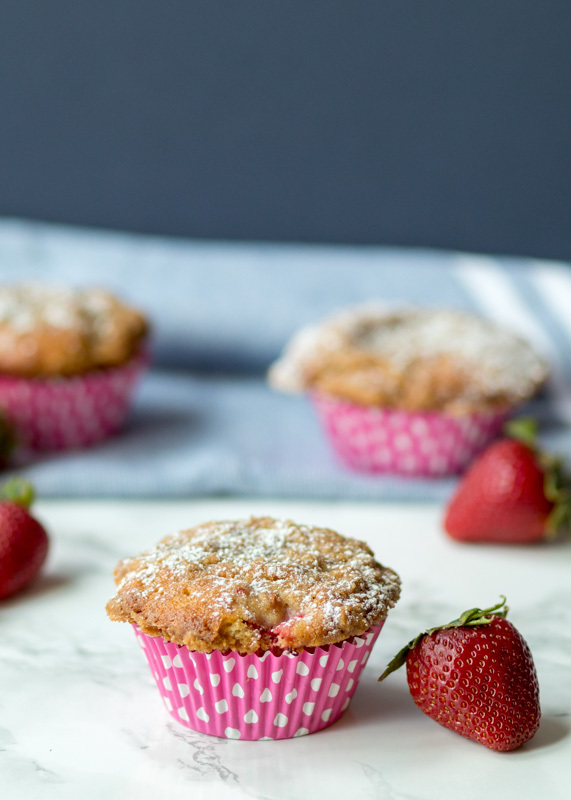 ), these Strawberry Rhubarb Crumble Muffins are one of our favorites so far. 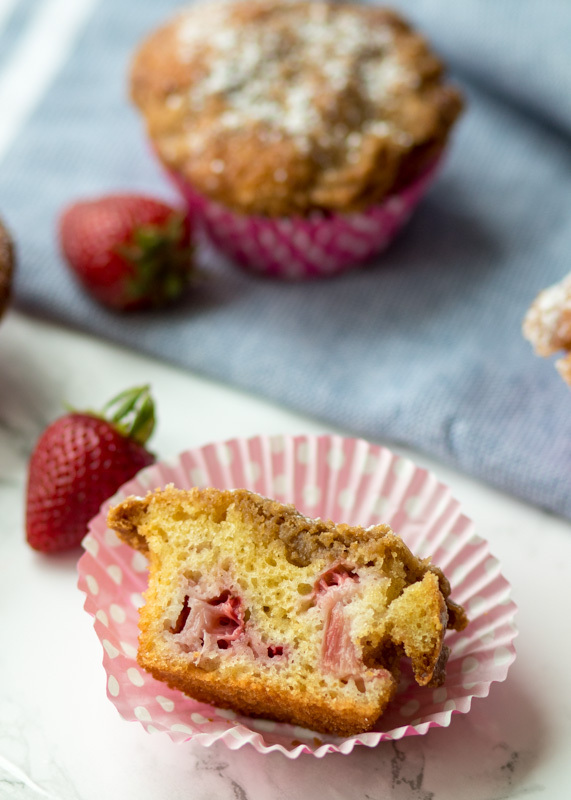 The muffins are soft and the inside is the texture of a super moist cake, which is caused by the juicy strawberries and rhubarb. What took these muffins into the over-the-top delicious category is the buttery brown sugar crumble topping. 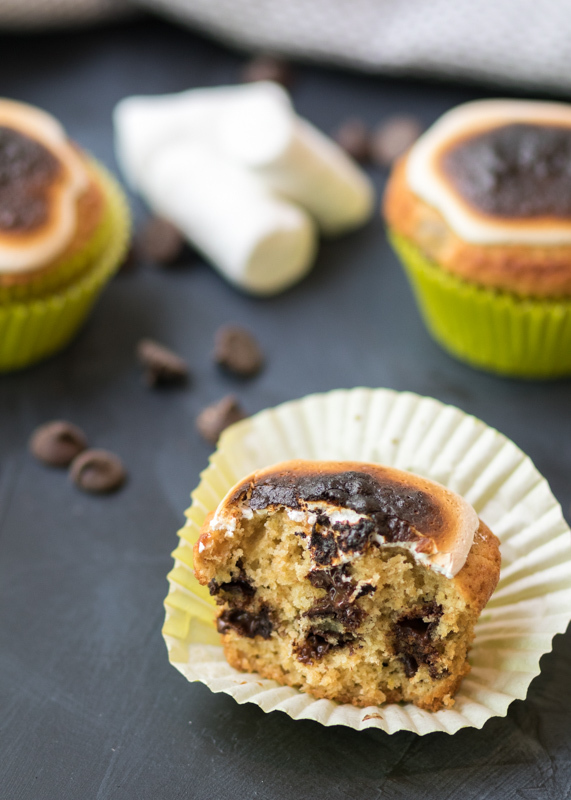 Slightly crunchy, the topping adds a second level of flavor that pairs perfectly with the fruit. 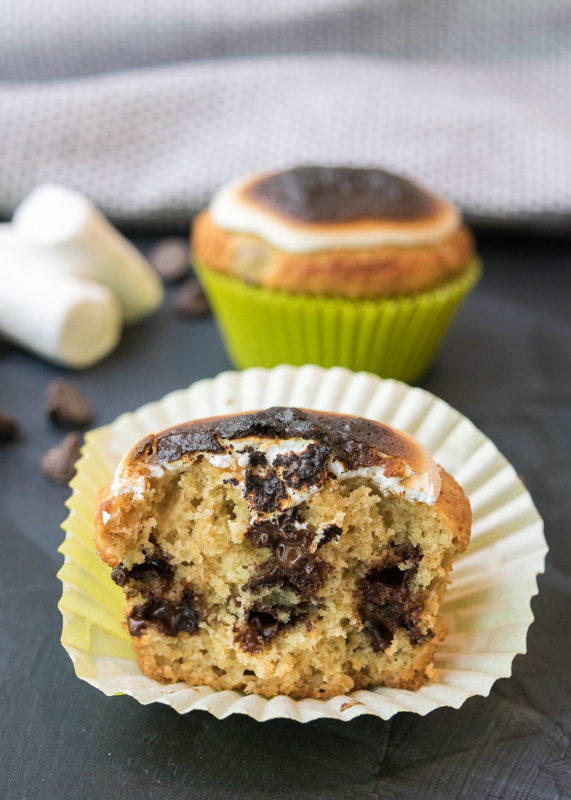 I have not been making any changes to these muffin recipes from the Food Network Magazine because I want to review them as written, but I did make an exception for the topping on these muffins due to an allergy. The topping calls for 3/4 cup rolled oats and since I am allergic to oats I omitted them so I would be able to enjoy them. The recipe calls for putting the crumble topping on the unbaked muffin batter before putting them in the oven and I already had almost too much crumble without the oats, so I’m sure if you included the oats you would have a fair amount of excess crumble topping. The top of my muffins didn’t look like the Food Network Magazine’s version since my crumble topping seemed to melt and spread. I’m not sure if this was because of the lack of oats or if my butter was too soft, but regardless they tasted so good I’m going to be making them this exact same way the next time I make them. This was my first time cooking with rhubarb and I found it to be a very simple ingredient to use. The recipe only calls for one stalk and it looks like a stalk of celery. I cut off the ends and chopped the rest up into 1/2-inch pieces before tossing in the sugar with the chopped strawberries. 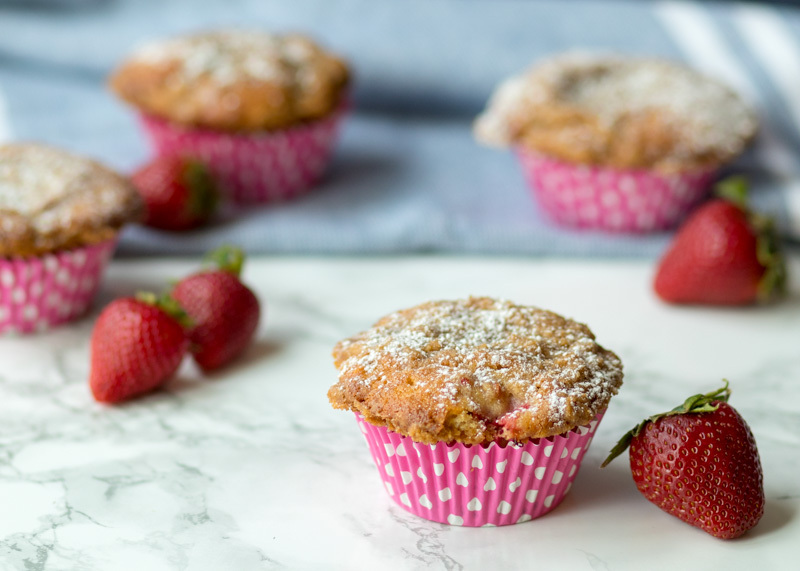 The rhubarb gets completely soft like the strawberries in the baked muffins and provides the right amount of tartness. Since the rhubarb was tossed with sugar and then baked, the tart quality of the rhubarb is very subtle and definitely not bitter, which is how people have described rhubarb to me in the past. If baked rhubarb always tastes this good there’s some more rhubarb-infused baked goods in my future while it’s still in season! In a medium bowl, mix together the oats (if using), brown sugar, flour and salt. Add the butter pieces and use a fork or pastry blender to cut in the butter until it creates small clumps. Set aside. 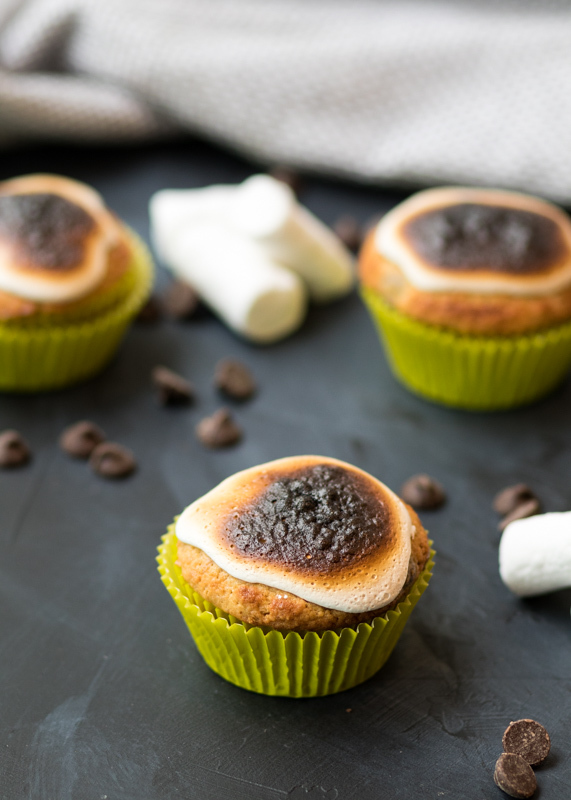 Preheat the oven to 350 degrees F. Line a 12-cup muffin pan with paper liners and set aside. 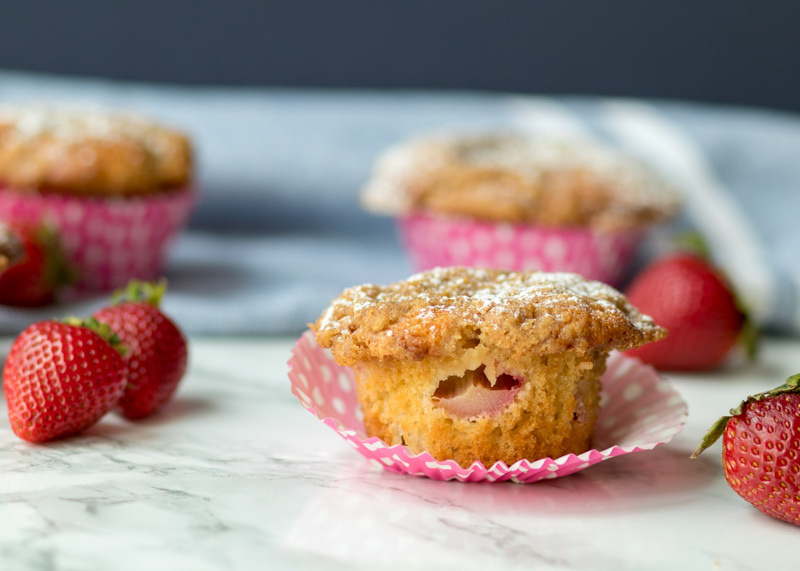 In a small bowl, combine the rhubarb, strawberries and 1 tablespoon of the granulated sugar. Set aside. In a large bowl, sift together the flour, ¾ cup granulated sugar, the baking powder, the baking soda and the salt. Make a well in the center then add the eggs to the well. Whisk to combine then stir in the milk, melted butter and lemon juice until just combined. Stir in the rhubarb mixture, being sure not to over-mix. Evenly divide the batter among the 12 muffin cups. They will be filled most of the way to the top. 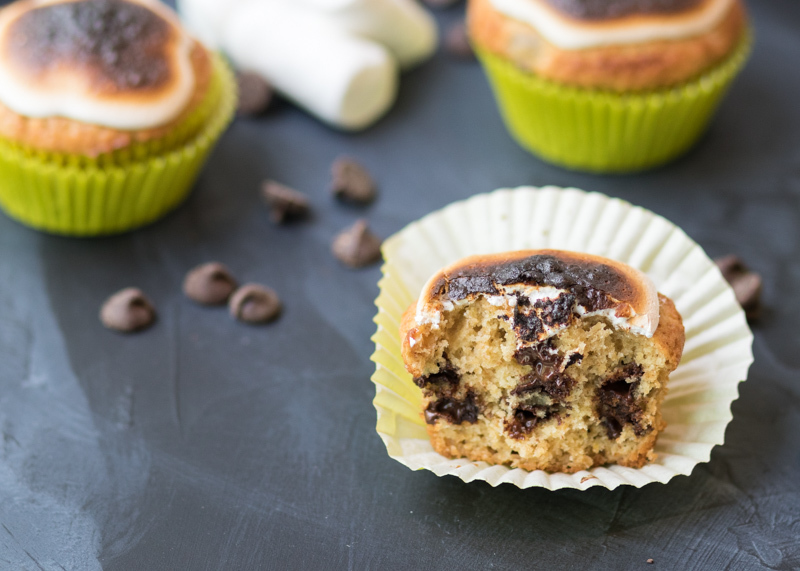 Top the muffin batter cups with the topping. There may be some leftover. 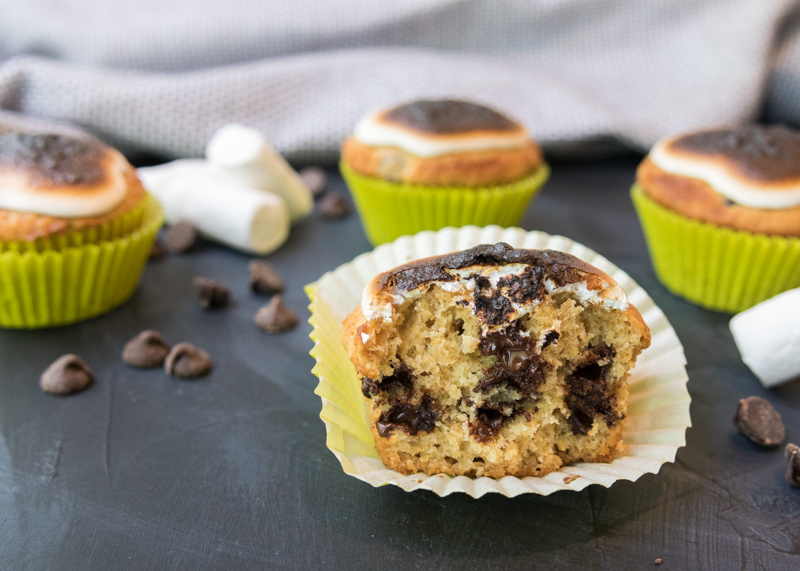 Bake the muffins for 25-30 minutes or until a toothpick inserted in the center of the muffin comes out clean and the tops of the muffins are lightly browned. Cool the muffins for 5 minutes in the pan then remove to a wire cooling rack. Once completely cool, dust with the powdered sugar.